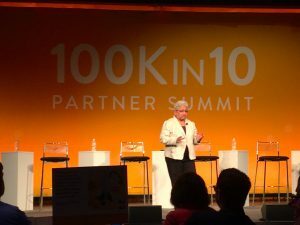 The 100Kin10 Summit was held in New York City this spring at the The Intrepid Sea, Air & Space Museum. STEMteachersNYC offered a presentation on our unique Professional Learning model, and also a feedback session with Colleen Megowan from the American Modeling Teachers Association. Both sessions were well received, with current and past STEMteachersNYC members in attendance. For those unfamiliar, 100Kin10 in an initiative that started in 2011 with the goal of training and retaining 100,000 STEM teachers by 2021. 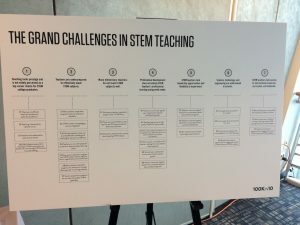 The organization is currently on target to meet its goal with over 40,000 STEM teachers already in the pipeline across the U.S. STEMteachersNYC plays a vital role in this effort by cultivating unique STEM communities of practice amongst teachers in NYC and across the tri-state region. 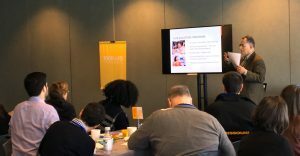 STEMteachersNYC is also working on a grant-funded initiative called Kid Talk Teacher Talk, which will bring together 26 elementary school teachers in the NYC area to work alongside mentor teachers this summer. Project leads Jason Sullivan and Amy Wish discussed their project goals and logic models at a 100Kin10 Network Improvement Committee the day after the summit. Stay tuned for more updates soon!